Note: Nest Bedding is a mattress company that primarily sells its beds online, though it does have a handful of showrooms. Here we review the Nest Hybrid Latex mattress, a latex over pocketed coils bed. 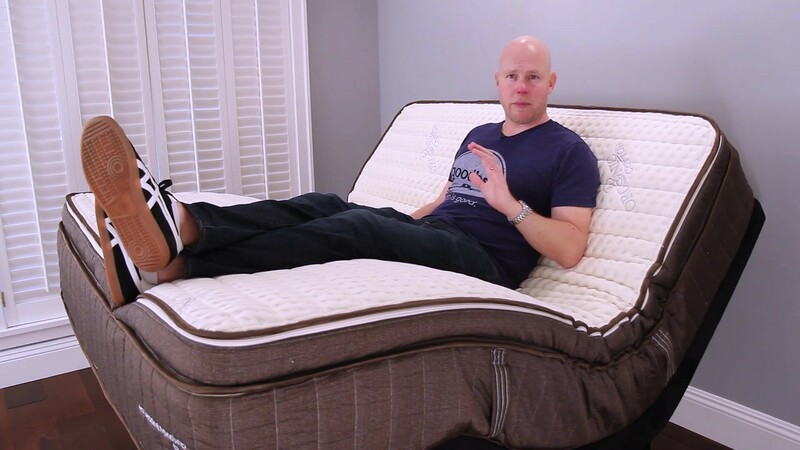 We have also reviewed the Alexander Signature memory foam bed, the Alexander Signature Hybrid bed, a mattress with memory foam on top of a layer of pocketed coils, and the Nest Love & Sleep mattress, their entry level foam mattress. 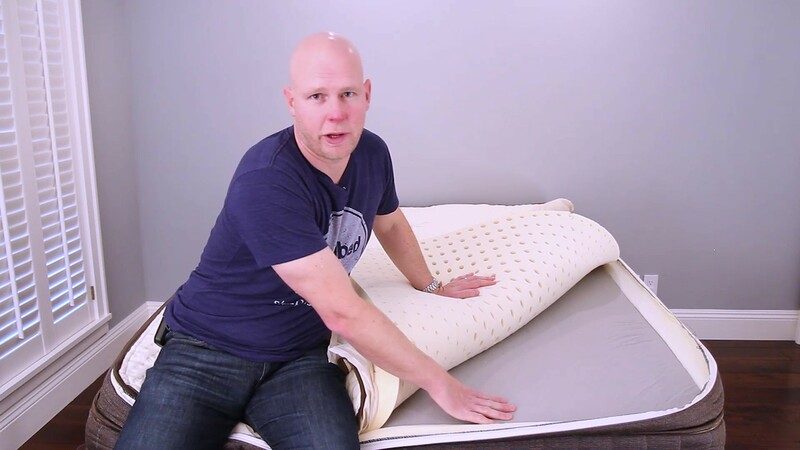 If you’d prefer to watch rather than read, check out our full Nest Hybrid Latex mattress video review above. GoodBed's Take – Who is the Best Match for a Nest Latex Hybrid Mattress? The Nest Latex Hybrid mattress combines a pocketed coil support layer with three inches of natural latex (a blend of natural rubber and synthetic materials) as the comfort layer. Altogether, the mattress measures about 12.5" in height. The combination of latex and coils is not one we have seen very often, and we were excited to put it through our tests. If you have spent some time reading the user reviews and ratings on GoodBed, you’ll notice that all mattresses get complaints for various reasons from owners. However, Nest Bedding mattresses overall enjoy very high satisfaction reviews. Owners really seem to love their Nest mattresses, generally. The Nest Hybrid Latex has some interesting available options. Though it has a good amount of eco-friendly materials, it is not 100% natural or organic. However, you can opt to order the mattress with 100% organic latex and an all-natural cover (adding about $600 - $1000 to cost depending on size). The cover of the mattress unzips to give access to the latex layer, which can be replaced down the road if your preferences change. You can also order this mattress (by phone only) as a dual-comfort model, meaning you can specify one side as medium and the other side as plush, just as an example. That's an interesting option if two partners have very different needs and preferences in terms of softness. The mattress comes in three softness choices: Plush, Medium, and Firm. We tested the Medium version, which the company says is most popular. On our scale, we found this mattress to be more of a medium-firm, just to the firmer side of what we would call medium. In our tests, we thought it would be an excellent choice a wide range of individuals. Back support in all sleeping positions was excellent, in our tests, with the possible exception of stomach sleepers that are significantly heavier than our tester, say over 250 pounds or so. Pressure relief was also a highlight in our evaluation, and we only had concerns about people who are very light, who might find the Medium version of the Nest Latex Hybrid a little too firm for their needs (in which case a Plush version is available). If you tend to sleep right on the edge of the bed (or perhaps find yourself pushed there by kids or pets), edge support was outstanding with the Nest Hybrid Latex mattress. And if you tend to sleep in a lot of positions, our tester found changing from one position to another almost effortless. The only major performance concern we had with this mattress was motion isolation. Beds that include springs are often not the best when it comes to dampening movement from one side of the bed to the other, and the Nest Hybrid Latex was not an exception. In practical terms, if you are easily disturbed by a partner's movements on the other side of the bed, this mattress isn't the best we tested. If you are interested in a latex bed, green and eco-friendly features may be of importance to you. The Next Latex Hybrid certainly has more natural materials than all-foam or memory foam beds. It's also stacked rather than glued, so there's less chance of off-gassing. However, if you want the "greenest" bed you can buy, you might opt for the organic version of this bed at higher cost. But for those looking for a balance of eco-friendly materials, and latex's pressure-relieving and support properties, combined with the more traditional feel and bounce of pocketed coils, we think the Nest Latex Hybrid mattress ticks a lot of boxes. Like most online mattress companies, Nest includes a 100-day trial period with full refund should you decide to return the bed. It also includes a "Lifetime Comfort Guarantee" meaning that if your needs change--say you need a different size--or your comfort preferences change, the company will sell you replacement layers or a new bed for 50% off the current price. It's available primarily online, but Nest does have a handful of showrooms where you can try the bed in person (store locator). You can place the Nest mattress atop the support of your choice, including a separately purchased box support, a bed frame, platform bed, or adjustable bed frame. The company does sell a foundation for the bed, but it's not required. The Nest Hybrid Latex mattress is just that, with properties of a latex mattress coupled with features of a traditional spring/coil mattress. The quilted pillow top also adds padding and loft to the bed. The latex layer is natural dunlop latex blend--that means it's a combination of natural latex (made from rubber trees) and synthetic latex (made from petroleum products). The wool layer acts as a natural fire retardant (required by law) as well as a heat regulator, intended to help keep you warm in winter and cool in summer. A new option from Nest: You can order this mattress with certified organic latex. That means that the top 3" layer of latex as well as the bottom .75" are 100% organic natural latex made from rubber trees. That's an option that adds anywhere from $600 to $1000 to the price, depending on the size you choose. 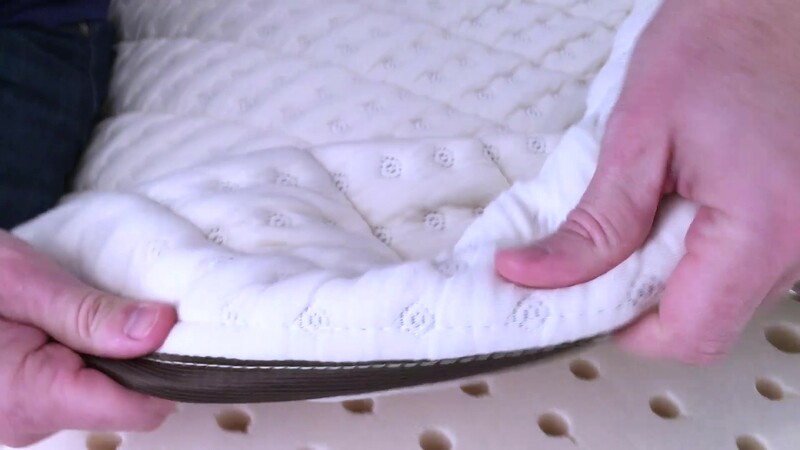 The three inside layers of the Nest Hybrid Latex mattress are wrapped in a very plush quilted pillow top and cover made of organic cotton and spandex (about 90% cotton). (Note that if you opt for the organic version of this mattress, the cover will be organic cotton knit and wool.) The top part of the cover zips off to give access to the latex layer, which is replaceable. Note that as of this update, the company has changed the design of the cover and it will not look exactly like the one we reviewed. Most noticeably, the side panels now have quilted channels. The Nest Hybrid Latex mattress comes in three versions: Plush, Medium and Firm. We tested the Medium model, which the company says is the most popular. In our estimation, we would class this mattress as a Medium Firm on our scale. It’s definitely on the firmer side of what we would define as Medium. An interesting option that's not advertised on the Nest website: You can order this mattress with two different softness levels. So if you prefer medium but your spouse prefers firm, the company will send you the top layer of latex as two pieces, which you place side by side. Note that you must call and order by phone to obtain pricing for this option. This refers to how deeply you sink into the mattress or feel cradled or hugged, versus a feeling of floating on top of the bed. We found the Next Hybrid Latex mattress to have average cushioning, and our tester felt quite floaty on the mattress. Keep in mind that we tested the Medium version of this bed. It also comes in a Firm version, which we would assume has less cushioning, and Plush version, which would likely be deeper cushioning. The Nest Hybrid Latex bed doesn’t have any memory foam, so it does not have any of that slow-responding memory feel. But it does have some bounce. 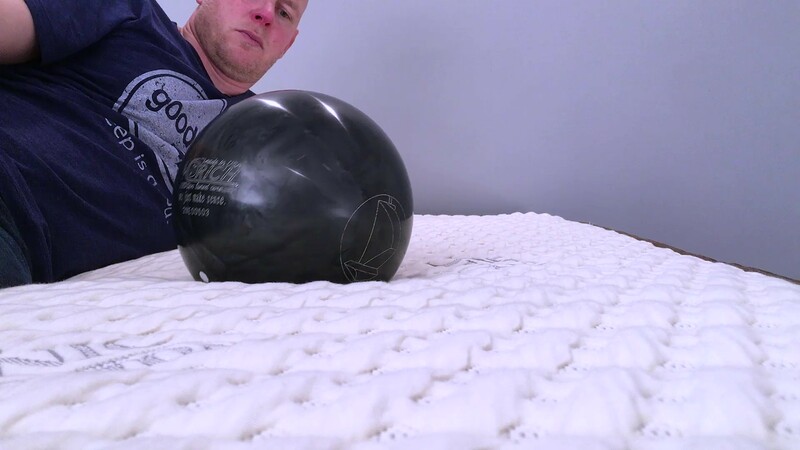 The latex layer imparts some surface bounce, and the pocketed coils below kicked in when our tester dropped his weight onto the bed, springing him back into the air. So if you like some bounce to your mattress, yet don’t particularly like that memory foam feeling of sinking into your mattress, the Nest Hybrid Latex may work for you. In our evaluations, the Next Hybrid Latex mattress afforded very good back support and spinal alignment in all sleeping positions (something that’s been comparatively rare in our history of reviewing mattresses). We only questioned its suitability for stomach sleepers who are significantly heavier than our 200-lb. tester. Overall, we believe this mattress will suit a wide variety of individuals. While our 200-lb. tester was on his back, he noted that his hips sank just deeply enough to create a good neutral spine. We felt that sleepers of a wide range of sizes and weights would have a similar experience, even those significantly heavier, owing to the supportive coils below. In our evaluation, side sleepers would also be well supported by the Nest Hybrid Latex bed. Our 200 lb. tester’s hips and shoulders sank into the bed just enough to create a neutral spinal position. We also felt that average to heavier people would be very supported while side sleeping. Stomach sleepers, in our view, would also be well served by this latex/coil hybrid bed. There was ample firmness to support our tester’s hips and midsection while on his stomach, without sinking down too far. (The risk for stomach sleepers is sinking down too deeply into a mattress, creating too much arch in the back which can lead to back pain down the road.) Our tester was well supported, and we felt that most sleepers would also experience good spinal alignment, owing to the supportive coils in the lower layer of this bed. The possible exception might be those who are a lot heavier than our tester (250 lbs.+), and in that case might opt for the Firm version of the Nest Hybrid Latex mattress. Overall, we found the pressure relief offered by this Nest mattress to be excellent. Latex in general has a very good reputation for pressure relief, right up there with memory foam. 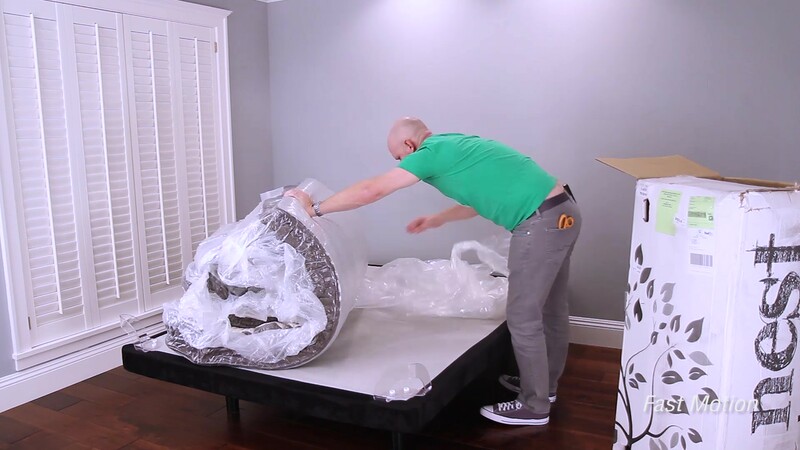 Because this mattress is relatively firm, we did wonder if people much lighter than our tester might not be heavy enough to compress the top latex layer enough and might find it too firm. In that case, a Plush version of the mattress is available, though we did not test it specifically. Overall, motion isolation for the Nest Hybrid Latex bed was good, but if you are very sensitive to a partner’s movements, you may want to explore other options. For most people, we do not think the Nest Hybrid Latex mattress will feel hot for three reasons designed to regulate heat. First, the cover includes a layer of wool; wool is a natural heat regulator. Second, the top latex layer has pin-core holes piercing the latex, allowing for air flow. And lastly, the pocketed coil layer is mostly air; the coils allow for lots of air flow. If overheating in bed is an issue for you, we think the Nest Hybrid Latex would be a good choice, especially if you don’t want a mattress that’s entirely springs or coils, or entirely foam. Edge support is important if you like to sit on the side of the bed, or if you tend to sleep along the edge. With the Nest Hybrid Latex mattress, our tester felt very stable sitting on the side of the bed. When laying on the very edge of the bed, our tester also felt very stable, and did not feel like he was leaning or rolling off the bed at all. If your pets or kids tend to push you towards the side of the bed, we think this mattress is worth consideration. Edge support was a real highlight in our tests. If you tend to move and change positions a lot over the course of a night, ease of repositioning will be a priority for you. We found the Nest Hybrid Latex bed to really shine in this area. Our tester had no trouble at all moving around or rolling into another position. If you are considering the Nest Hybrid Latex, then low odors, minimal use of chemicals, and eco-friendly materials are likely important to you. Let’s take a closer look. The cover of the Nest mattress is made of 90% organic cotton and 10% spandex. Next is a layer of wool batting, and wool of course is a natural product. The latex is natural, but a blend -- companies may call their latex natural if it contains partly natural rubber; the rest is synthetic rubber, made from petroleum products. It is worth noting that the latex isn’t organic; you can, however, opt to order this mattress with organic latex at a cost of roughly $600-$1000 more, depending on size. The latex used in the Hybrid Latex bed is certified by OKEO-TEX, which means it meets manufacturing standards that ensures minimal off-gassing. Lastly, the support layer of pocketed coils are steel, which does not off-gas, and in the end can be potentially recycled. Taken overall, while the entire mattress is not organic, the Nest Hybrid Latex has many more eco-friendly features than most. We tested the Nest Hybrid Latex bed on top of our standard adjustable base to see what would happen. We found that the mattress conforms fairly well right out of the box, with some lifting at the foot of the bed; this is very normal for new mattresses. With use and after a break-in period, we find that most beds improve in this regard. 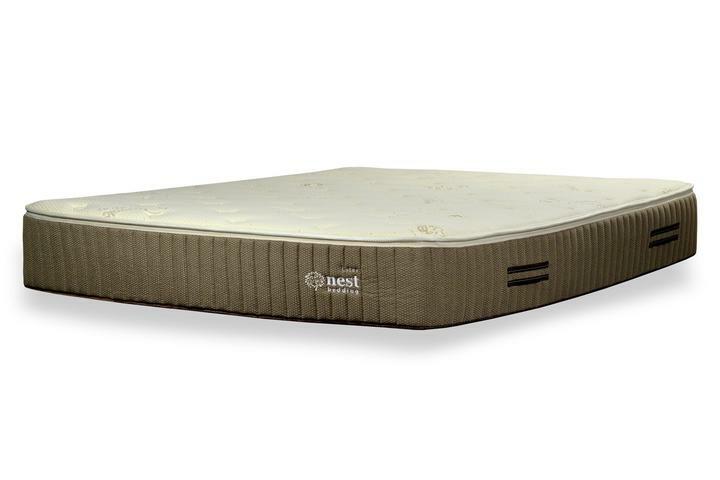 The Nest Hybrid Latex mattress from Nest Bedding is a 12.5” mattress that combines supportive pocketed coils with natural latex that's a blend of real latex from rubber trees and synthetic latex. It's a combination that we don't see very often. 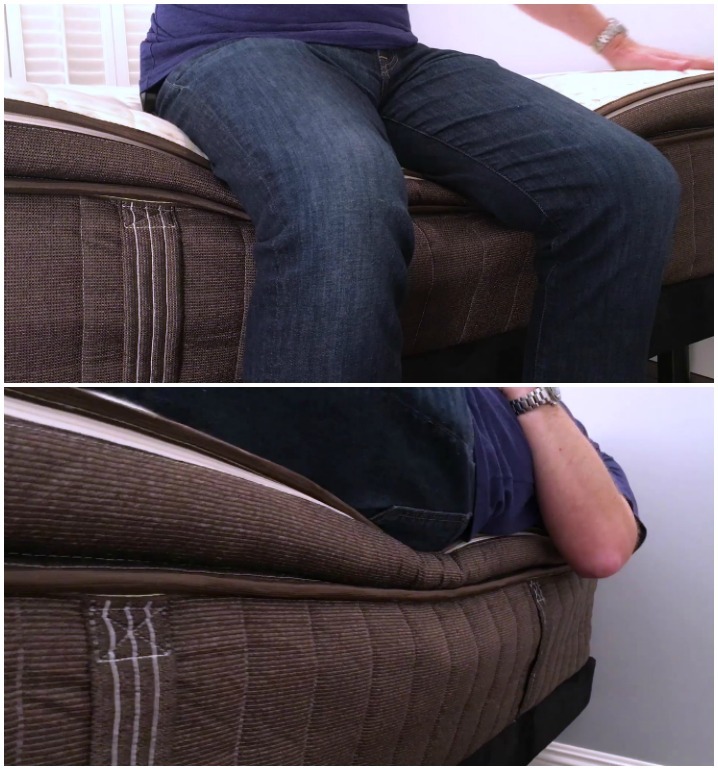 Since our video review, the company has also made some tweaks to this mattress. The price has dropped for all sizes. But the company also added an organic option; for roughly $600 to $1000 more, depending on size, you can opt for 100% organic latex and a cover of organic cotton and wool. You're also getting an interesting "Lifetime Comfort Guarantee" which allows you to buy a new mattress down the road for 50% off the current pricing. It's also worth noting that the user ratings for Nest mattresses on GoodBed.com are the highest we've seen for any brand. We don't have any concerns that the Nest Hybrid Latex won't last an average mattress lifespan. When examining the materials and construction, we noticed no 'red flags.' The latex layer has a firmness and density we think will be durable, and pocked steel coils have a long reputation for durability. Another feature worth noting: The cover unzips and you could actually replace the latex layer down the road if you need to, giving you more options for the lifetime of this bed. We think the Nest Hybrid Latex mattress is an excellent value. Its construction quality, high customer reviews, performance in our tests for a wide variety of people, and use of eco-friendly materials makes it a standout in its price range. If you prefer to try a mattress in a store, Nest does have a handful of showrooms, primarily in California and Arizona so you can try before you buy. Otherwise, take comfort that the company offers a 100-night trial, and if you’re not happy for any reason after trying the mattress, you can get a full refund. Nest Bedding includes free delivery, which is not particularly unusual among its competitors. Delivery is by common carrier like FedEx, who will deliver the box to your door. Nest does offer an in-home setup at extra cost, calculated depending on where you live. The company also offers what it calls a "Lifetime Comfort Guarantee." If at any point if your needs change -- say you need a different size, or your firmness preference changes--the company will sell you a new model for 50% off the going rate. It's an interesting policy that we haven't commonly seen. One of the biggest, if not THE biggest complaints about any mattress from consumers regards body impressions — the inability of a mattress to spring back, eventually creating a low spot/sinkhole in the mattress. As such, mattress warranties all contain a term defining how big a sag or ‘body impression’ (measured when no one is on the mattress) is considered a defect, and thus covered under the warranty. The industry standard for mattresses is generally between ¾” and 1.5”. Nest Bedding has chosen to cover indentations that meet or exceed 1”. Practically speaking, that means any softening or sagging would need to be at least that deep before the warranty would offer you protection. See: Nest warranty. This warranty extends to the original owner for as long as they own the mattress, and assumes it has been place upon an appropriate foundation. Summary: Is the Nest Hybrid Latex Mattress Right for You? In our view, the Nest Latex Hybrid mattress will tick a lot of boxes for a lot of sleepers. Based on our findings, here’s who we think is the best and worst match for a Purple mattress. Is the Nest Hybrid Latex bed right for you? Take our Mattress Match Quiz to find mattresses that fit your needs, based on your preferences and price range. Looking for more on the Nest mattress? Click here to visit their website at NestBedding.com. This bed combines innersprings with memory foam, but is it the best of both worlds? Does the Love & Sleep Mattress live up to its name?